I love onions, just about anyway you cook them. One Sunday (football) afternoon my hub asked for burgers and guacamole for the playoff game he was going to watch. I still had some of my smash burger meat I had bought at the Neon Pig in Tupelo back in the summer. I’ve been hoarding it as I usually do when I find something I really like. They call this the “smash grind” mash grind and is made from aged filet, ribeye, new york strip, sirloin, and benton’s bacon. rich and smokey, and they say the best burger in the world which is served with homemade hoisin and comeback sauces. So the burgers were going to be easy to make and the guacamole I could make in my sleep. I had a gigantic sweet onion I had just bought so I gave him the option of onion rings or sautéed onions. Since he said sautéed, I decided to roast the whole onion and add a few extra ingredients to make them even better. This was a huge onion and I would recommend using small onions to do this recipe. I had the “giant” so decided to use it since I knew we were not having a lot of other things on the menu and we both love onions. I had Swiss cheese on hand so that’s what I use; but mozzarella, Monterey Jack or even blue would be delicious also. 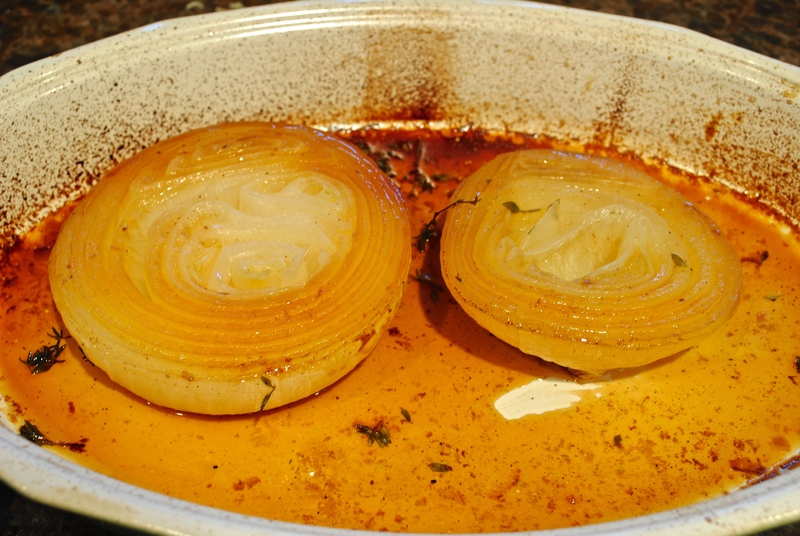 Put the onions cut side down and then pour the broth mixture over the onions. Add thyme to the dish. 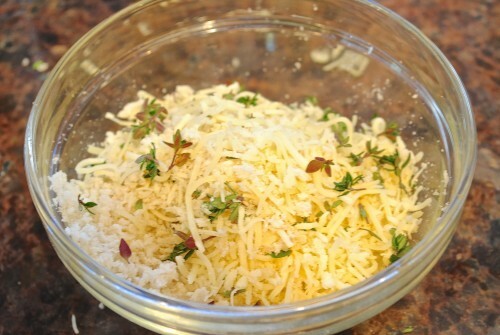 Mix the cheese, breadcrumbs and one teaspoon of the thyme together for the topping. Cook cover half way through cooking time then uncover and finish cooking. 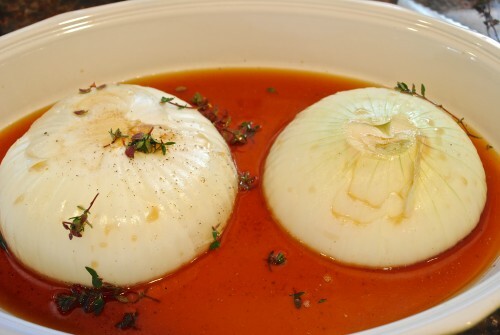 Remove cover and turn over onions. 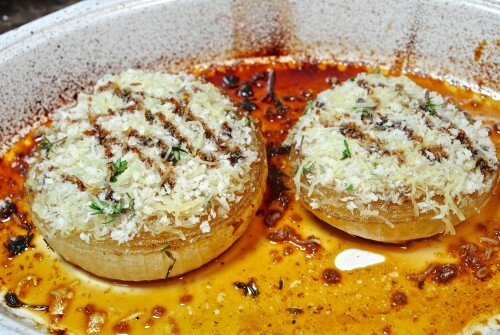 Add topping and then bake until browned. Remove from oven and drizzle with more balsamic vinegar. 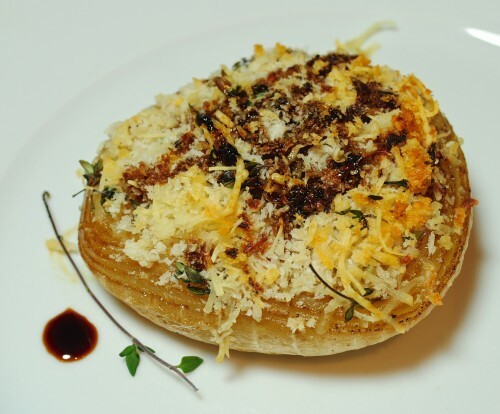 BLAST FROM THE PAST: Another onion recipe — Souffled Onion Soup has a cheese soufflé mixture on top of the soup and is a real treat. The soufflé does not fall and I think that is because the heat and steam from the soup keeps it puffed up while you are eating. WARNING: It’s a rich soup so maybe a good salad is all you want to serve with it. Mix the cheese, 1 teaspoon thyme and breadcrumbs, set aside. Coat baking dish with cooking spray. 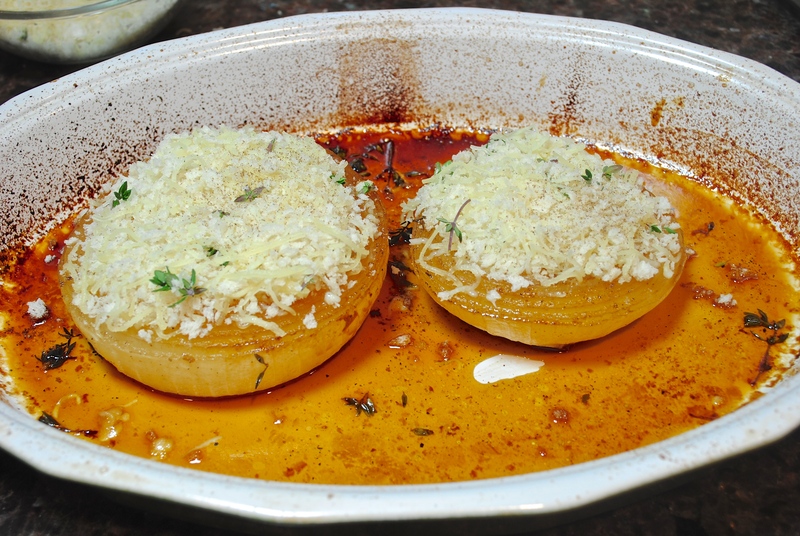 Trim off a little from the bottoms of each onion half and remove the peeling. Arrange the halves, cut side down in baking dish. 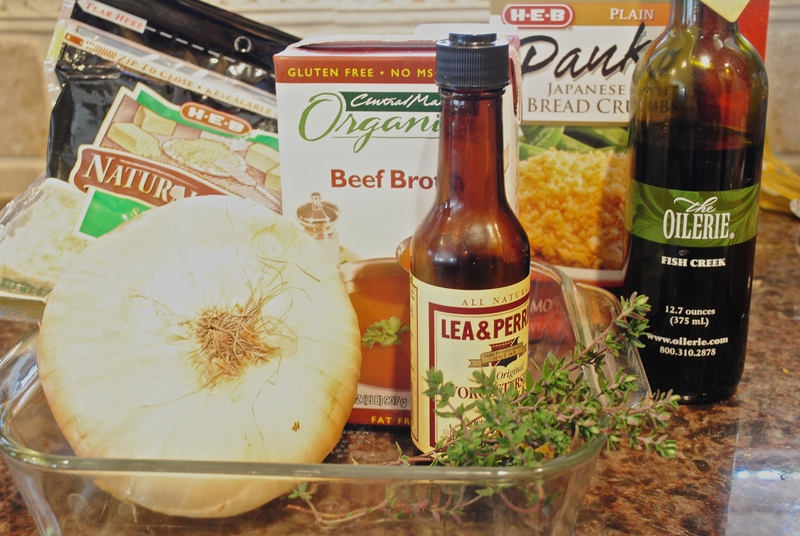 In a bowl, mix the beef broth, 2 teaspoons thyme, and worchestershite sauce. Pour this mixture over the onions and cover with foil. Bake at 450° for about 30 minutes. After 30 minutes, uncover and continue baking for another 30 minutes. 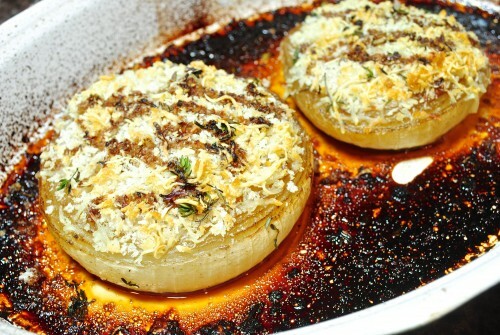 Remove onions from the oven and if they are tender when pierced with a knife top with some of the cheese/breadcrumb mixture and bake for another 5-10 minutes until cheese has melted and browned.